Blog post on promising palliative care education legislation. Update: On June 27, 2018 the full House of Representatives passed the Palliative Care and Hospice Education and Training Act (PCHETA). 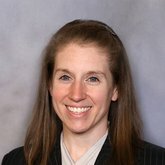 This legislation will authorize the Department of Health and Human Services to award grants or contracts for Palliative Care and Hospice Education Centers, promote the career development of nurses and physicians in palliative care through fellowship funding and academic career awards, and promote research and outreach in the delivery of care for patients living with a serious illness. On March 22, 2017, the Palliative Care and Hospice Education and Training Act (PCHETA) was reintroduced in both the House (H.R. 1676) and Senate (S. 693). Many readers will probably be familiar with this piece of bipartisan legislation, as it returns following a strong showing in the 114th Congress – capped off by hearing in the House Energy and Commerce’s Subcommittee on Health, with testimony provided by Dr. R. Sean Morrison. As palliative care champions prepare to once again descend upon Washington, DC on June 28, 2017 for the annual Patient Quality of Life (PQLC) Lobby Day, we wanted to take this opportunity to provide a PCHETA refresher! Key provisions in PCHETA fall under three main areas: workforce, public awareness, and research. Workforce. The majority of this legislation focuses on expanding opportunities for training in palliative and hospice care, and offering incentives to attract and retain providers across disciplines. Nationally, there are approximately 120 ACGME-accredited palliative care fellowship programs which graduate fewer than 330 trainees per year; a total of 7,570 ABMS/AOA physicians have achieved subspecialty certification in hospice and palliative medicine since 2008. Meanwhile, as the U.S. population continues to age and develop chronic, ongoing progressive illnesses, it is generally understood that there will be an insufficient number of palliative care specialists to serve all patients with serious illness and their families/caregivers. Therefore, PCHETA seeks to increase palliative care capacity in all clinicians by establishing Palliative Care and Hospice Education Centers. These centers will expand both early education and mid-career training opportunities for doctors, nurses, social workers, chaplains, and other allied health professionals in the core knowledge and skills of palliative care: pain and symptom management, communication, and care coordination. PCHETA will also provide grants and contracts for palliative care specialists who are willing to teach the next generation of clinicians. Structuring training in this way will help increase the number of health professionals across disciplines who can provide primary palliative care, which will in turn allow palliative care specialists to care for the most complex patients and families. Public Awareness. Despite rapid growth in the field, a large proportion of patients and families who could benefit from palliative care still don’t know what it is and when it is appropriate. Therefore, PCHETA establishes a national campaign to inform both the public and health professionals about the benefits of palliative care, including creating and disseminating information about the services that are available to support patients with serious or life-threatening illness. Research. Finally, PCHETA addresses research gaps by directing the National Institutes of Health (NIH) to develop a research strategy in palliative care to address quality of care and quality of life for patients with serious illness. Thanks to organizations such as the National Palliative Care Research Center and the Palliative Care Research Cooperative, as well as more recent support from the Patient-Centered Outcomes Research Institute, the body of evidence supporting palliative care has grown over the last fifteen years. However, only a fraction of this investment in research has come from the federal government, and significant gaps remain. More funding and increased attention are needed to understand the effectiveness of palliative care across diagnoses, care settings, and patient populations; furthermore, there is a critical need to invest in new therapies that can help address the most common symptoms in seriously ill patients such as breathlessness, fatigue, nausea, and even pain where alternatives to opioids are desperately needed. PCHETA’s directive to the NIH will help jump-start its investment in research directed at improving quality of life for people with serious illness. PCHETA is already making great progress in the 115th Congress. Upon reintroduction, the PQLC submitted a letter of support signed by fifty-two organizations including the American Cancer Society Cancer Action Network, the American Heart Association/American Stroke Association, the Alzheimer’s Association, and the National Coalition for Hospice and Palliative Care. As of publication, roughly three months after introduction, the bill has 120 House cosponsors and 7 Senate cosponsors. And on June 15, the PQLC led a very successful Virtual Lobby Day in which palliative care champions across the country requested their legislators’ support for PCHETA via social media. So how can you get involved moving forward? 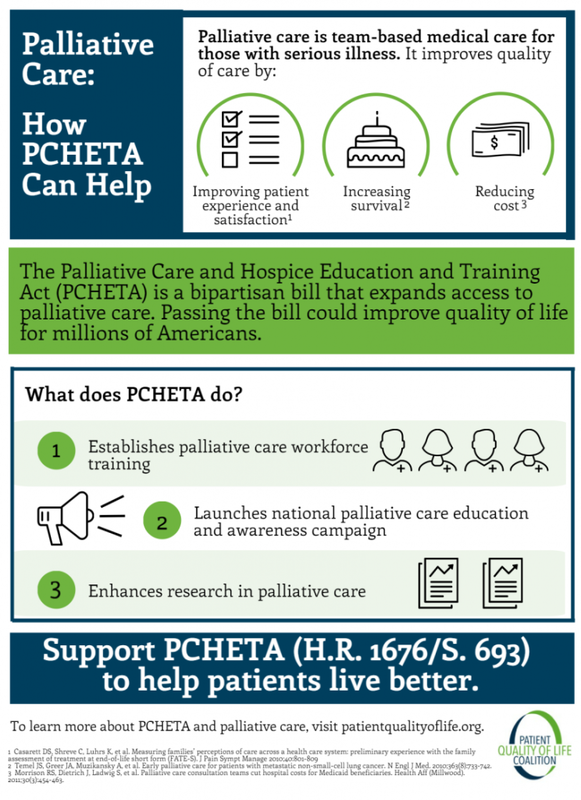 Ask your members of Congress to support PCHETA. The American Academy of Hospice and Palliative Medicine (AAHPM) maintains a Legislative Action Center which allows advocates to quickly and easily reach out to their legislators. To submit an email support letter, visit this link. Visit your legislators. When all is said and done, the strongest way to convey your support is to show up in person! It’s not too late to register for the June 28th PQLC In-Person Lobby Day in Washington, D.C. (contact Stacie.Sinclair@mssm.edu for more information). And if you can’t make it to DC, schedule an appointment at your representative’s district office during the July recess. For all of the above, remember to thank your legislators when they sign on. In the meantime, don’t hesitate to reach out if you have any questions or comments about PCHETA. Happy championing! To discuss this and other important legislature in-person with experts in the field, register for CAPC National Seminar 2017 today to attend sessions and hear keynote speakers from leaders across the continuum.